Reading players will subsidise the trip for fans visiting Manchester City on 24 November - partly because of the club's inconsistent start to the season. The Royals squad, currently 12th in the Premier League, have donated £5,000 to supporters heading to Eastlands. Reading captain Graeme Murty told BBC Sport: "We know that at the moment we are massively inconsistent. "It's not easy to justify spending so much money to watch us perform and this is giving something back to the fans." Steve Coppell's side have endured a difficult beginning to their second season in the top flight and following their 3-1 defeat at Fulham on Saturday are only five points clear of the relegation zone. "I would be lying if I said that the poor start didn't enter certain people's thinking," said Murty, who is in his 10th season at the Berkshire club. What do you make of the Reading players' donation? "It can't be good going to places like Fratton Park and coming out after a 7-4 loss wearing a Reading shirt. "But more than that there has been a growing realisation among the players of how expensive it is, especially for parents who bring their kids to a game." Reading froze their season-ticket prices for the 2007-08 campaign yet they have to date seen attendances fall slightly. They now intend to recognise those who follow them around the country. The first 350 fans who book the journey on the official supporters' trust coaches will pay £5 for their travel instead of the normal £20. The move comes after a week in which the Sports Minister Gerry Sutcliffe claimed sky-high wages and ticket prices in top-flight football are alienating fans. "Ordinary working people who want to see Manchester United face being priced out," said Sutcliffe. "There is a danger that there will be a move away from the game and we don't want to be in a position where people are alienated." Murty pointed out that the subsidisation of travel may not become a regular offering but added: "We decided that it would be a nice gesture if we could get behind the fans the way they get behind us and try to alleviate that financial burden. "The players had the ultimate say-so over whether we did it or not. It's not something we've been ordered to do, it's something that as a group of people we felt was right. "We feel, not guilty, but that we a have a little bit of responsibility towards that cost. I'm not saying it's getting beyond a joke, the level of cost, but it certainly is almost taking the game away from its roots. "If that eventuality ever comes to pass then football is going to be the only loser. If you take the game away from the common person in the street then football is going to go downhill from there on." Malcolm Clarke, chairman of the Football Supporters' Federation, has applauded Reading's gesture but insists it does not mask the wider problem of overpriced tickets in the game. 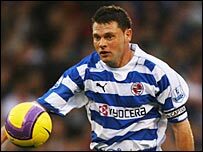 "The Reading players are to be congratulated for recognising the contribution that their supporters make," said Clarke. "What is badly needed is a big reduction in ticket prices so the cost of watching football isn't as big as it is at the moment. "But, certainly, a particular gesture by this group of players is to be congratulated."